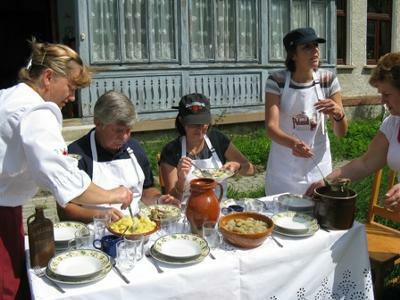 Cooking Your Way From Krakow to Zakopane - A Cooking Tour to Poland. When you travel with us, you'll know that your Polish experience will be culturally rich, casually elegant, and truly unique. We travel to specially selected regions of Poland to learn about the roots of regional fare and explore how modern chefs are transitioning traditional dishes to contemporary cuisine. Our world-class vacations let you indulge your foodie side with hands-on and demonstration-style cooking lessons and trips to local markets, farms and festivals. Along the way we also visit with Polish bakers, farmers, shop owners and chefs to learn the secrets and collect the recipes of this outstanding culinary culture. To relax and rejuvenate each evening, you'll stay in comfortable, chic accommodations ranging from charming hotels to genuine castles and palaces. call us Toll Free 888-703-8130 or 406-579-6435.